This is a wrongful death lawsuit filed on behalf of a man in Baltimore County after he dies following a catheter insertion. It was filed in Health Claims Arbitration on April 17, 2017 and it is the 181st medical malpractice case filed in Maryland this year. A 48-year-old man is undergoing dialysis at DaVita Carroll County Dialysis Facility. He goes for his treatment one day but he is sent to Dialysis Access Specialists due to a clotted access point. He needs placement of a tunneled dialysis catheter. Placing a central catheter is a multi-step process and when step is properly completed one proceeds with the next step. With proper technique a puncture such as this should not occur in the first place. Fluoroscopic evaluation of the guide wire and catheter position should have been done at each step of the procedure to assure adequate placement. In my opinion this was not done and was a breach of the standard of care. Had this been done the errant wire or catheter position would have been detected and corrective action taken. While inserting the catheter, it coils back on itself. There is a leakage of contrast into the right portal space. The wire and catheter perforated the right subclavian vein. The man is transported to the ER at St. Joseph Medical Center where resuscitation efforts are unsuccessful. The man dies, and the cause of his death is declared to be a perforation of right subclavian vein during medical procedure. The victim's family files a lawsuit contending that patient's death was a direct result of the mal-positioned tunneled dialysis catheter. Hundreds of thousands of people in this country suffer from end stage kidney disease requiring some form of dialysis treatment. Dialysis performs removes toxic products from the blood and maintains a normal balance of salts and fluid in the body. These tasks are ordinarily performed by a healthy kidney. 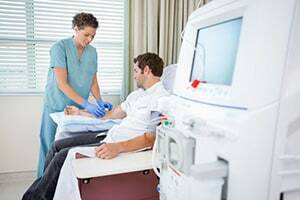 In the hemodialysis procedure, blood is rapidly removed from a patient's body for filtration through a dialysis machine. Absent a successful kidney transplant, this time consuming procedure must be performed every 2-3 days for the remainder of a patient's life. To perform hemodialysis, access to circulation is needed via a fistula, graft or catheter. The decedent in this case had thrombus, a clotted fistula or graft, so he needed a temporary catheter. Plaintiff's expert underscores the failure to detect the improper placement. So the complaint is not necessarily getting it wrong as it is failure to recognize and remedy the problem. Presumably, the defendants will argue that puncturing the subclavian artery is a known risk of the procedure. Have you been injured due to negligence of a doctor? Miller & Zois can help you get the compensation you deserve. We have a long history of obtaining results in medical malpractice cases. Get an online case review or call us today at 800-553-8082 to speak to an attorney ready to help you.